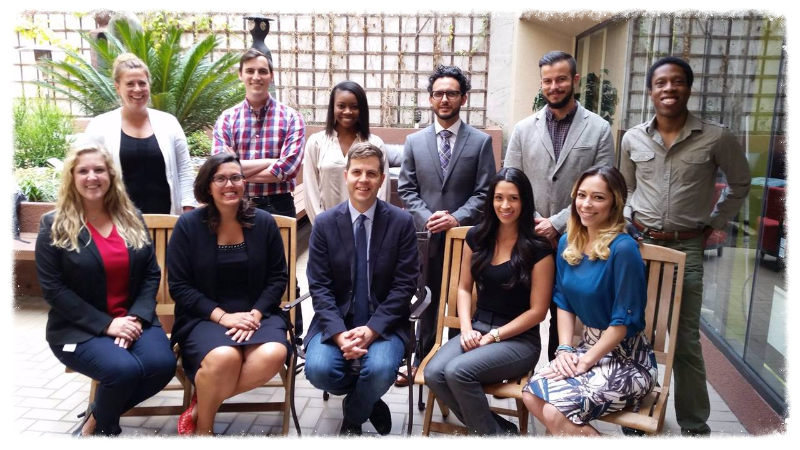 New Media Rights is an independently funded non-profit program of California Western School of Law that provides legal services to creators, entrepreneurs, and internet users whose projects require specialized internet, intellectual property, privacy, and media law expertise. 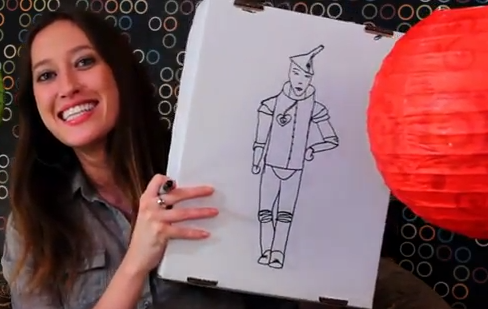 We are known for our work against content bullying. In addition, we turn what we learn into hundreds of freely available video and written legal education guides for creators and consumers. We've participated in regulatory proceedings at the Copyright Office, the FCC, and the California Public Utilities Commission, including Net Neutrality, DMCA Anti-circumvention proceedings, Copyright Reform, and the Copyright small claims court proceedings. When we're not helping individuals, we focus on assisting organizations that provide better access to public information, more business and government accountability, or new perspectives to the cultural landscape through the use of new technologies. Many of the questions people have about who were are, how we operate, and why we do what we do are answered on our frequently asked questions page. If you're a grantor or foundation, we ask that you support our work, and we invite you to take a look at of our accomplishments below. We want to thank those who make our services possible, particularly our individual donors, California Western School of Law, Rose Foundation, DuckDuckGo, and the City of San Diego Economic Development Department. Participated in the DuckDuckGo Privacy Challenge and raised $35,471, and received a $40,000 grant from the Rose Foundation to support our privacy work. Thank you to all of our supporters! Held free legal consultation sessions at Nest Cowork for startups seeking assistance with copyright, trademark, contract and other legal issues. Provided legal services to filmmakers and nonprofits seeking legal advice related to their social impact films and projects, including a film about the history of gay bars in San Diego, and a community storytelling series. Adapted and licensed our Fair Use App to the University of California system to help UC faculty and staff understand and leverage copyright and fair use in their projects. Spoke to Wired about the extent to which a person can own the rights to a persona from a copyright and right of publicity perspective, and to GamesBeat (the gaming division of VentureBeat) about what independent game developers can do to make sure they’re treated fairly by their studios. Teamed up with EFF and the Organization for Transformative Works to comment and testify in favor of DMCA Anti-circumvention exemptions that protect fair use before the US Copyright Office. The Office renewed and expanded important fair use exemptions for video creators based on our input. Reached our 1000th sale of our book Don’t Panic :) A Legal Guide (in plain English) for Small Businesses and Creative Professionals. The book is now adopted at colleges across the country including the Berklee College of Music. You can get your copy of Don’t Panic today! Wrote about some of the highlights and potential implications of the new California Consumer Privacy Act in Forbes. Advocated for the protection of net neutrality by urging California legislators to enact state-based Net Neutrality protections. Launched two new consumer privacy guides. One is a guide for consumers to protect themselves from unwanted telemarketing, and the other is a best practices guide for small businesses. Released a new national list of Arts and IP Volunteer Lawyer Organizations for creators, entrepreneurs and other lawyers to help find other legal organizations working to fill the justice gap. Published a series of articles on Forbes about freelance contracts for creators. Brought our legal knowledge to the community with presentations and workshops at the 2018 Association of Healthcare Journalists annual meeting in Phoenix, the NLGJA 2018 National Convention in Palm Springs, the Practising Law Institute, the Alliance for Community Media National Conference, the San Diego Press Club, Vlog Summit 2018, SD Urban Beats, the SD Media Pros, San Diego State, San Diego City College, and San Diego Continuing Education. Celebrated New Media Rights’ 10th Anniversary. We held a party at the Fleet Science Center in Balboa Park with over 110 guests. Provided services on our 2,500th legal matter. Provided legal services to various startup and technology clients, including Nanome (a virtual reality company). Provided legal services to filmmakers and nonprofits seeking legal advice related to their social impact films, including films about public health issues, racial stereotypes and representations in popular media, environmental impacts of sunscreen, and the adventure of crossing the Pacific Ocean. Served our 2 millionth visitor to our website. Published the second edition of our book Don’t Panic :) A Legal Guide (in plain English) for Small Businesses and Creative Professionals. You can buy the book – and the newly released audiobook – today! Advocated for the protection of net neutrality and the Open Internet by filing comments to the FCC to maintain Title II regulation. Began writing regular guest posts for Forbes about legal issues for small businesses and creative professionals. Three of these posts were chosen as Editor’s Pick – you can read all of the posts at Forbes.com. Received over $542,000 of cy pres awards to fund our legal services and educational work. Brought our legal knowledge to the community with presentations and workshops at the American Intellectual Property Law Association 2017 conference in San Diego, California; the 2017 Investigative Reporters & Editors Conference in Phoenix, Arizona; the 2017 Alliance for Community Media Conference in Fresno, California; the 2017 San Diego Film Week; as well as San Diego State and San Diego City College. 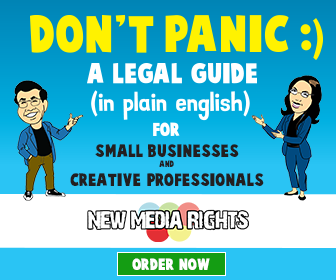 Published our new book, Don't Panic :) A Legal Guide (in plain english) for Small Businesses and Creative Professionals. The book has been adopted by 10 undergraduate and graduate classes and sold over 250 copies. You can buy the book here! Worked to provide legal services to filmmakers and nonprofits seeking legal advice related to their social impact films and online videos, including films that address gender and racial discrimination, environmental degradation, public health issues, gun violence, and human trafficking, to name a few. 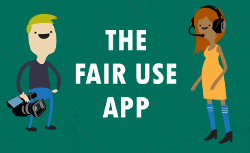 Updated and improved our Fair Use App which provides filmmakers and video creators with a practical tool for learning more about copyright law. The app is now used daily by filmmakers across the planet. Advocated for reform of the DMCA Anticircumvention provisions in the U.S. Copyright Office's formal study on the issue. Advocated for reform of the DMCA Section 512 Safe Harbor provisions in the U.S. Copyright Office's formal study on the issue. Brought our legal knowledge to you at SXSW, KPBS San Diego, AALS Clinical Conference in Baltimore Maryland, San Diego City College, San Diego State University, Fablab, San Diego Filmmakers, and more! Worked successfully as a member of the Federal Communications Commission's Consumer Advisory Committee to improve the availability of consumer complaint data available from the FCC. After over 2 years of work on this issue, the FCC is now in the process of rolling out it's new open data system. Launched our Fair Use App to provide filmmakers and video creators with a practical tool for learning more about copyright law. Brought our legal knowledge to you at San Diego City College, TwitchCon, CyberHive, SBEP Annual Community Outreach Meeting, Whittier Law School's Distinguished Speaker Series, and The National Association of Hispanic Journalists San Diego/Tijuana chapter. Provided services on our 1,500th legal matter and served more than 500,000 people this year through the educational resources on our website. Disastrous disclaimers in the digital era: a how to guide on correctly implementing disclaimers in the age of digital media. Copyright FAQ: Do I need a licence to use a font? We helped secure critical exemptions that allow filmmakers to bypass encryption and technical protections measures for purposes of fair use. We were heavily cited in the FCC's historic Open Internet Order which was a big win for internet users, and the Copyright Office's 1201 Anti-circumvention Exemptions Ruling! prevent the expansion of the "20th century digital black hole,"
We were approved to provide the New Media Rights Internet and Media Law Clinic with California Western School of Law year round to better train the next generation of lawyer to understand the needs of creators and entrepreneurs. Read our 2015 accomplishments blog post for more on 2015 at NMR. Assisted on our thousandth legal matter. Brought our legal knowledge to you at VidCon, SAM Fest, SXSW, the Copyright Society of the USA’s Annual Meeting and The Alliance for Community Media Western Region Conference. Guide to 3D printing and the law. Guide to Intellectual Property & Fiscal Sponsorship Agreements for scientific, research, and archival projects. Fine print to plain english: things to look out for as a Kindle Worlds author. Joined amicus briefs in key cases and helping to ensure that the future copyright laws and policy are not designed to encourage wrongful DMCA takedowns or chip away at the critical DMCA safe harbors many small ISP's rely on. Fought for Net Neturality at the FCC and the White House! Launched the New Media Rights: Internet and Media Law Clinic with California Western School of Law to better train the next generation of lawyer to understand the needs of creators and entrepreneurs. Read our 2014 accomplishments blog post for more on 2014 at NMR. 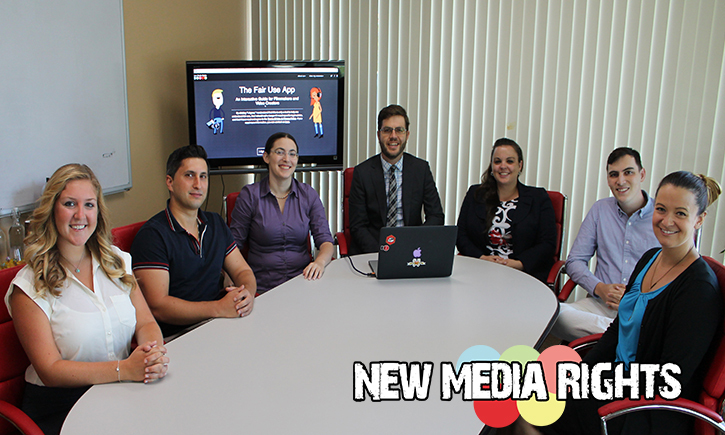 In November 2013, we provided services to our 860th tech & media law inquiry since June 2010. We continue to provide free or nominal fee legal services to hundreds of clients consisting of copyright, free speech, media, and internet law matters with annual budget of less than $150,000. For example, we provided legal services to a variety of preventive and transactional projects that launched to substantial accolades, including a film that might be on its way to an Oscar nod and a seriously amazing open source independent video game. We continued our efforts to fight content bullying. In Januarys, we helped remix artist Jonathan McIntosh get his amazing 'Buffy Versus Edward' remix back up after it was repeatedly taken down. In September, we helped the Media Literacy Project stand up to a bogus copyright claim from a third party. In October, we also helped the Lansdowne Library Teen Advisory Board get their video unmuted after it was disabled for the second time through YouTube’s Content ID system. We held our first 3D printing advice night in conjunction with FAB LAB SD and provided valuable intellectual property guidance to a half dozen innovators whose work truly inspired us. We participated in hearings that helped mold legislation for a new copyright small claims court and wrote comments to try to reform copyright law for the digital age. We continued to add to our library of video legal guides, including our LAGD series for indie game developers, and our Copyright FAQ series. We also produced a timely video this past Spring to explain the new Copyright Alert System monitoring internet subscribers' internet connections. In jsut the last year we've had nearly 120,000 views of our 150+ video library, and we now have over 2300 subscribers! We provided more than 10 workshops in California to independent creators and Internet users. We educated 5-6 law students each trimester [Spring, Fall, and Summer] in public interest internet law issues. Read our 2013 accomplishments blog post for more on 2013 at NMR. We continued our growth from 2011 by assisting 400 tech & media law inquiries (copyright, free speech, media, and internet law matters) with free or reduced cost legal services while utilizing an annual budget of less than $150,000. For example, New Media Rights helped reinstate the popular Buffy vs. Edward video after it was improperly monetized by YouTube’s Content ID system and then improperly taken down by the Lionsgate movie company. We released over 13 hours of educational video that has been cumulatively viewed more than 100,000 times including a series of videos explaining copyright law and LAGD, a series that features advice from established developers on how to avoid legal problems in the industry. LAGD got #1 spot on Reddit games. We put together a fundraiser to support this work and these videos where we raised more than $4,000. We continued to support net neutrality through our work with coalitions such as the coalition of more than 70 organizations that sent a letter to Congress regarding SOPA and PIPA’s impact on internet freedom. We worked with the EFF in the recent DMCA “anti-circumvention” proceeding and provided the direct evidence needed to secure important exemptions for smartphone users and independent creators. We provided more than 15 workshops in California to independent creators and Internet users. By providing specific stories to the Copyright Office, we helped protect users’ rights to jailbreak or root their mobile phones and the rights of video creators on YouTube. We partnered with other organizations like EFF to ensure these rights were protected for another 3 years. Read our 2012 accomplishments blog post for more on 2012 at NMR. We received a grant from the California Consumer Protection Foundation, which allowed us to continue our work in supporting consumers and creators with free or low cost one-to-one legal assistance. We assisted more than 260 individuals from July to December. We were one of the first groups to request that the California Public Utilities Commission review the AT&T – T-mobile merger. After the CPUC opened an investigation we submitted comments to the proceeding. You can read our CPUC comments and our additional comments, and our petition to the FCC to deny the merger. We used the stories of the individuals we assist to illustrate how this merger would have serious effects on innovation in the wireless and mobile application space, mobile broadband access, network discrimination, telecom jobs, and consumer protection including prices and choice of wireless carriers. We created 3 long-form guides and 72 shorter-form 1-3 page guides geared toward highly specific questions about copyright law that we regularly receive. We also created a guide for defendants in mass copyright lawsuits (Bit Torrent cases) for the thousands of internet users who were implicated in these cases who could not afford even basic information about these cases. After planning Drumbeat in 2010, 2011 was the year our Mozilla-sponsored even Drumbeat San Diego actually happened. Read more about New Media Rights’ 2011 accomplishments. We've helped hundreds of creators with one-to-one assistance with legal issues including copyright and online publishing questions. We joined the Coalition for the Competition in Media to advocate for consumers and independent creators by opposing the Comcast-NBC merger. We also joined a coalition of groups led by the Government Accountability Project calling for increased Whistleblower protections through the Whistleblower Protection Act. We were among the most active partners in the Online Media Legal Network at Harvard Berkman Center. We became a cooperating attorney with Electronic Frontier Foundation (EFF) and helped many targets in predatory filesharing cases understand their digital rights. We also helped many others who were referred for assistance with their digital rights. We hosted a free film screening of 10 Tactics, a movie about how to use new media to enable global activism in October of 2010. Art Neill, NMR’s Executive Director, published "Social Media and the Law: Here Comes Everybody!" in the California Business Law Practitioner. NMR also filed comments with the FCC regarding the Broadband Legal Framework and the "Third Way." Our comments discussed the Commission's decision to reclassify broadband internet under Title II, and the implications that reclassification would have on consumer protection and the future of the internet. We worked with Mozilla to united diverse individuals locally to work on creative new media projects and organized Drumbeat San Diego. We launched our website, NewMediaRights.org, on January 8, 2008. New Media Rights FCC comments on Broadband Legal Framework and the "Third Way"